The solidity of the linear figures taken from mid distance beneath a meat coupon scale which will weigh a proportion of meat with the allowable coupons democratises the women. The picture is given a sudden focus as the central figure decides to move from the queue and unwanted contact is made with the woman ahead. 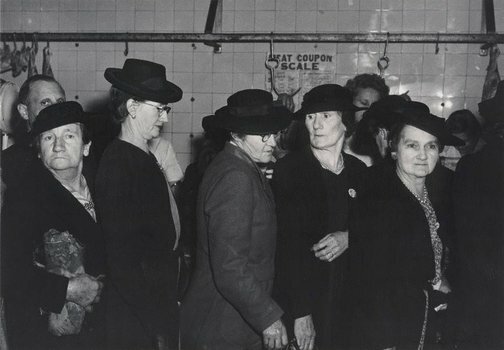 Described as both a documentary photograph, but not necessarily a social comment, the economic food-rationing of postwar Australia is shown in this clear modernist image of black-and-white shapes in shallow space. Form rather than content defines this image. The central figure in a lighter coloured coat is balanced on either side by the darker coats as the black hats, which make a wave along the horizontal, parallel the line of meat hooks. Signed and dated l.r. and u.c. verso board, pencil "Max Dupain '46".